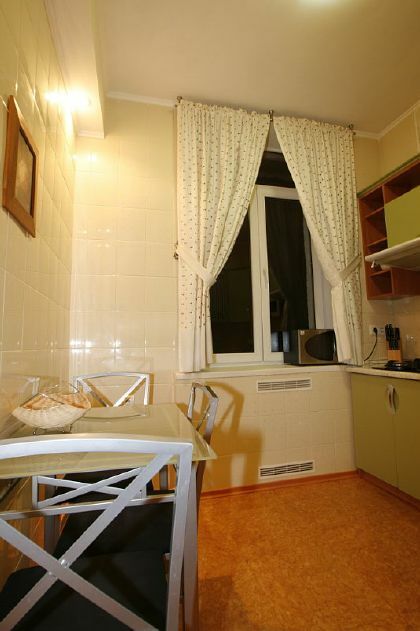 This Kiev apartment is situated on the 5th floor of a 6-story building with elevator and a door code on the entrance door. The apartment comes fully equipped and furnished with everything required for safe, comfort and cozy living, including a large reclining couch (convertible to full sized bed), 32” screen TV with Cable (over 65 channels), DVD player, queen sized bed in the spacious bedroom, large wardrobe area, big balcony with fantastic view of historic area of Kiev Lipki, fully equipped kitchen with microwave, full-size bathroom with both bathtub, washing machine, air conditioner and much more. 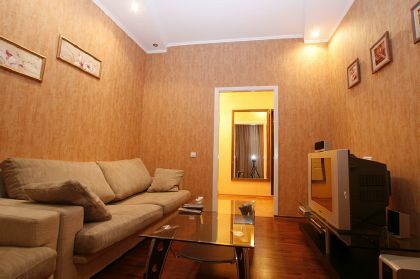 This apartment is amongst the best deals in Kiev if requires a budget-luxury, modern and sunny accommodation in the absolute central location of Kiev. 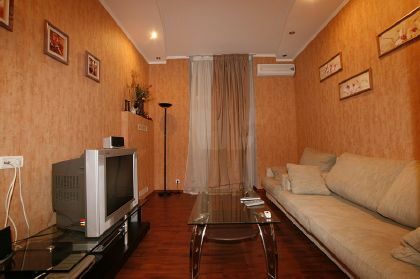 Living Room: The apartment’s living room features a reclining couch (convertible to full sized bed for two people), air conditioner, 32” TV with cable (over 65 channels), DVD player, local phone, coffee table, and the entrance to a big balcony. Bedroom: Spacious, featuring a queen sized bed, large wardrobe and air conditioner. 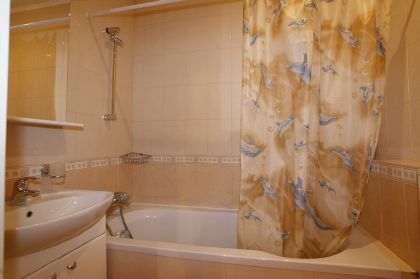 Bathroom: Roomy, featuring a large bathtub, drawer and a washing machine.